Recently, I was invited by The East London Hotel to stay a night. While I was their guest, all opinions are my own. 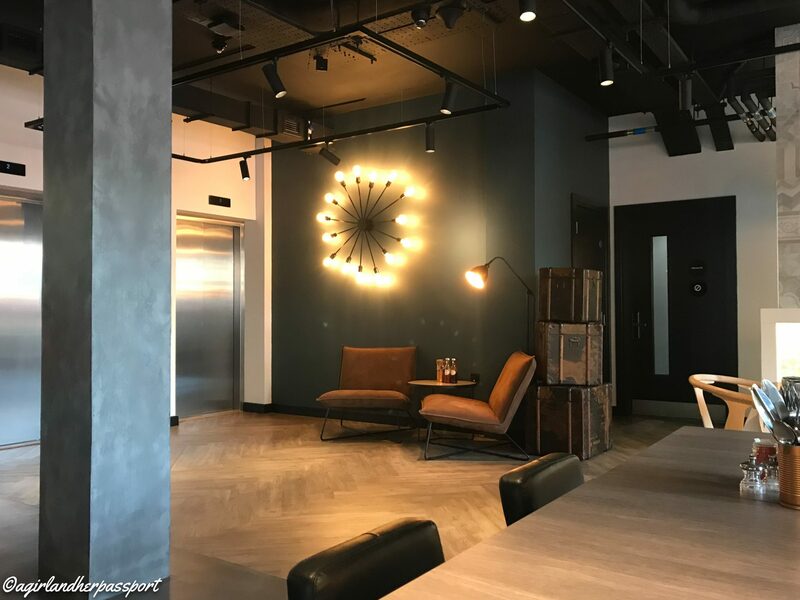 The East London Hotel opened in September of this year in a former wine warehouse. The hotel prices are affordable, especially for London, but also because it feels like a boutique hotel. My room at The East London Hotel was a standard double room with a window. 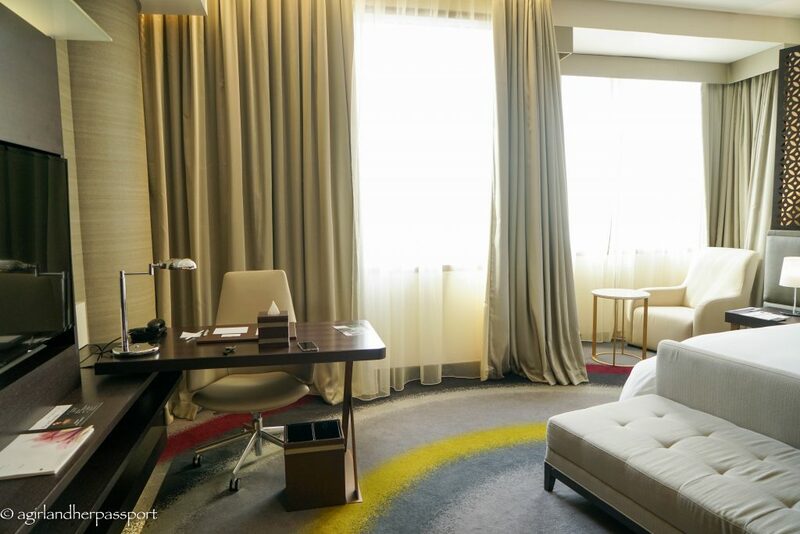 Some rooms do not have a window, so if that is important to you, make sure you double-check when you book. I arrived at night so I couldn’t see much of the view till the next morning. While the room is on the small side, it is well thought out and I had enough space. The bed takes up much of the room and is one of the most comfortable hotel beds I have slept in! Plus it had four pillows and I love having tons of pillows. Under the bed is storage for your suitcase, which if you had two people in the room you would need. Inside the headboard are built in reading lights that turn on when you pull them out. Right above the bed is a massive flat screen tv which is great when you come back to your room and want to chill before going to sleep. The bathroom is also compact but never felt too small. 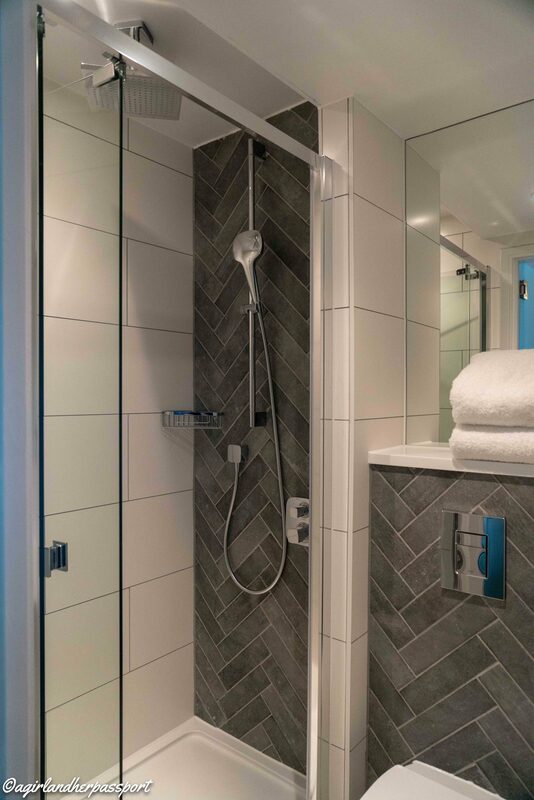 It feels luxurious with the rainfall showerhead and modern design. Hot water was almost on instantly and the hotel’s toiletry brand is Rituals, which I love. 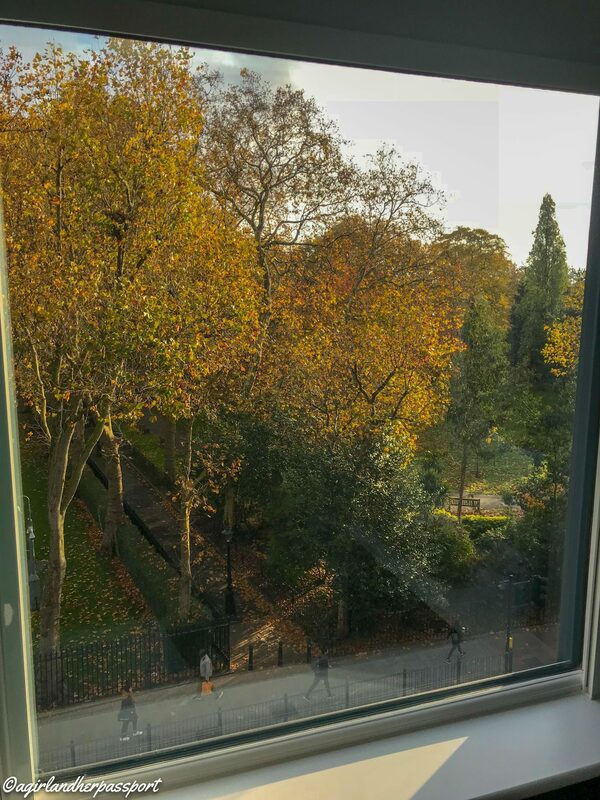 In the morning, I raised the window shade and was greeted with a beautiful view of the park across the street. I enjoyed looking out over it while I enjoyed a coffee from the Nespresso machine in the room. The only drawback about the room for me was that they did not install any international plugs, which would have been easy to do in a new hotel. The one USB plug was a good alternative though. Since I only stayed one night, I am unsure of how the good housekeeping was once a room was slept in. What I loved was the switch inside the room that changed the color of the sign outside the door. Red was for do not disturb and green was housekeeping requested. I hate those hangtags and loved this alternative. Breakfast is served on the ground floor of the hotel. This area is also the reception area but feels more like a coffee shop or bar. Rather than it being a breakfast buffet, which I was expecting, it was a sit-down breakfast. You had the choice of a bagel or sourdough break with two toppings. You also got a coffee and juice. Then you could add a pastry or yogurt. 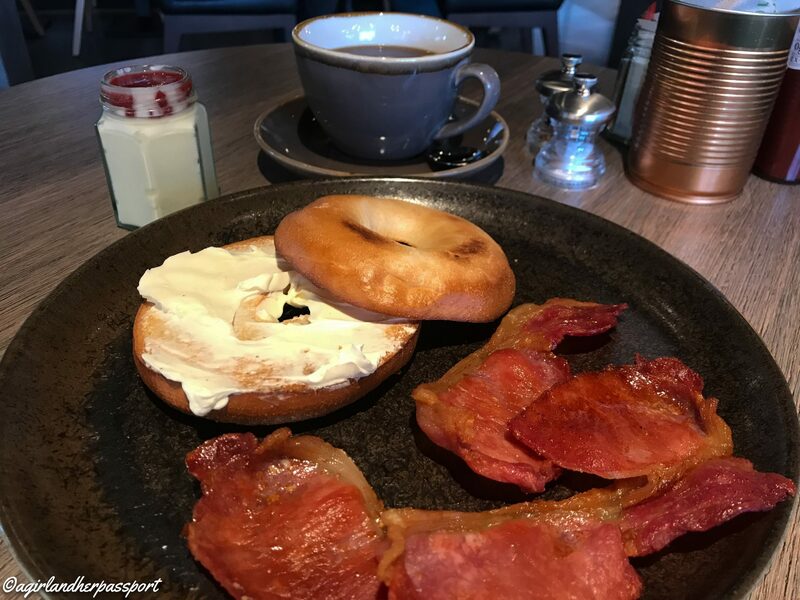 I opted for a bagel with cream cheese and bacon on the side with yogurt. The service was fast and the food was good. I wished there had been a healthy option like oatmeal though. There was also no water offered during breakfast. In what is probably an upcoming trend in hotels is that there was self check-in. Despite this, I was guided through the process with the help of a staff member. After entering your last name and confirming your dates, you are instructed to take a key card and place it on the reader. The card is then made. You can make more than one if you need. Check-out was a similar process and you just turn in the key card in a drop box. What I liked about not having a reception was that it allowed the room to be used for other things throughout the day. In the morning, breakfast is served. Later the room is a coffee shop and a bar. People were working on their laptops or watching the television. It seemed like a way for people to meet others like you would in a hostel setting. Another trend I see happening in hotels is the lack of phones in the rooms and offering contact via Whatsapp. The East London Hotel also operates on this model. I messaged them a question and was immediately answered. The drawbacks to this are the inability to give you a wake-up call, which if you have an early flight to catch it could be an issue, and you have to have Whatsapp downloaded. 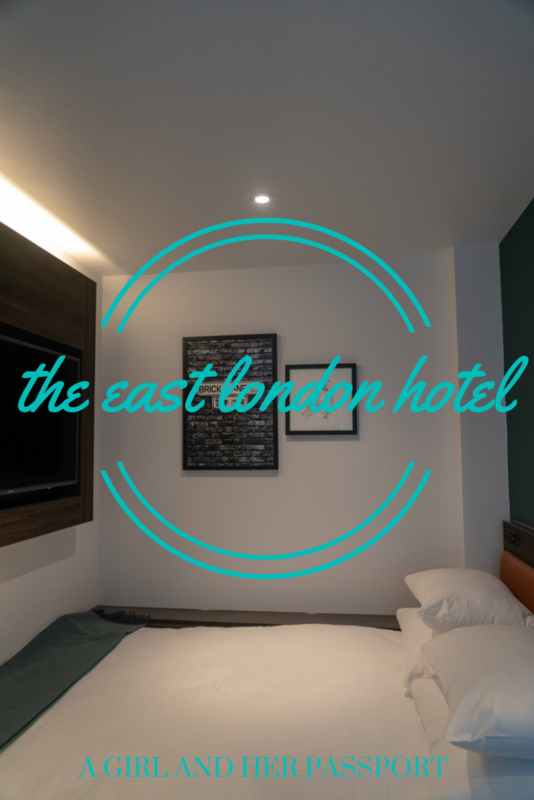 Obviously, The East London Hotel is in East London but the great thing is that is two blocks from the Bethnal Green tube station, which means you can be in Central London in about 20 minutes. The V&A Museum of Childhood is right across the street as well as the museum park and Bethnal Green Garden. Behind the hotel is Paradise Row with several restaurants and bars. 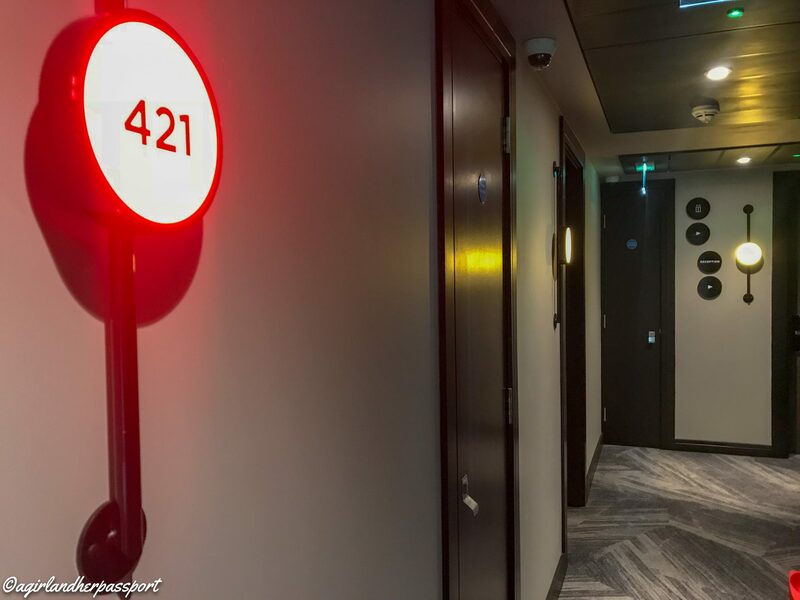 The location makes it a great place to base yourself during your London trip. 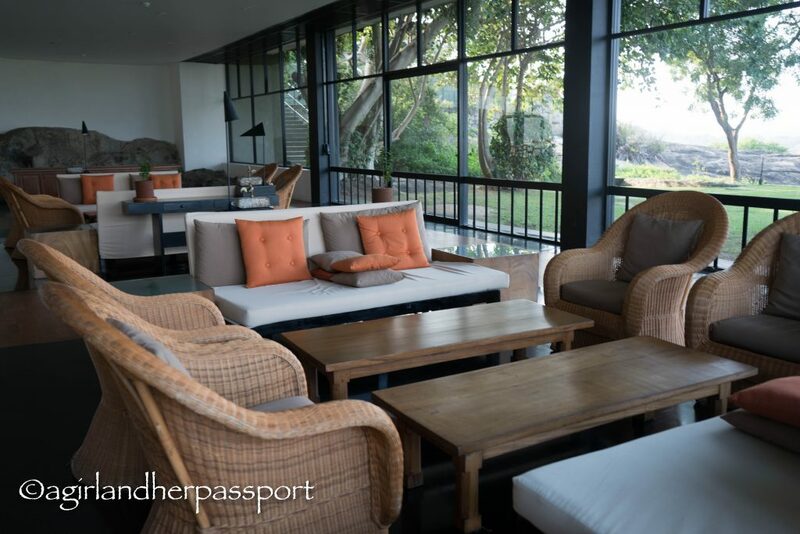 Overall, I enjoyed my stay at The East London Hotel and would definitely stay again. 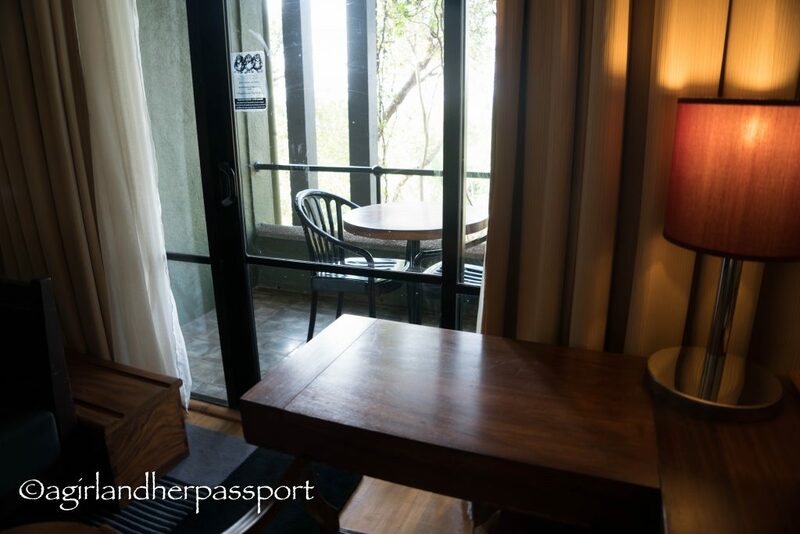 I loved the cozy vibe of the main floor and the English feel of the rooms and while it doesn’t have tons of amenities, the great location makes up for that! When deciding where I was going to “live” for a month on the Greek island of Ios, I knew I wanted to be able to cook while I was there. This meant I needed to find a place with a kitchen and I was hoping for a place that had a monthly rate as well. I did lots of research trying to find the right place including Airbnbs and looking at smaller hotels. The Airbnbs were further away from my preferred location and some only had a shared kitchen. 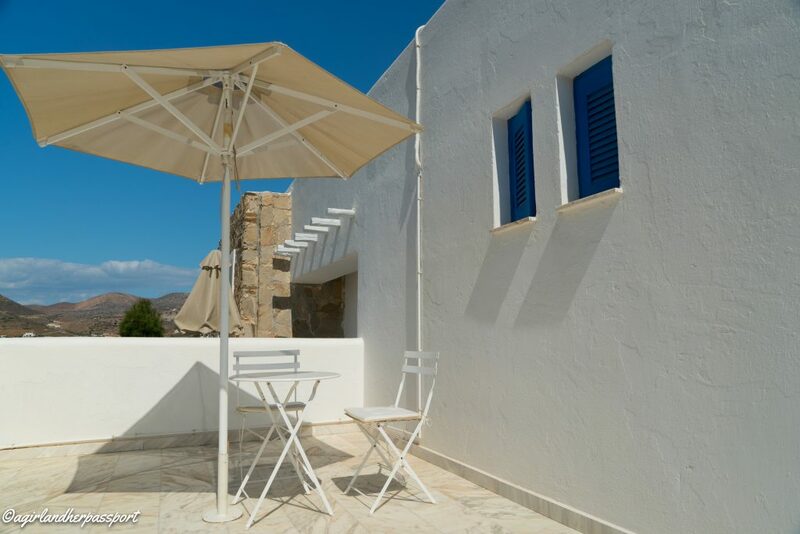 Finally, I found the amazing Kritikakis Village Hotel. Not only did each room have a small kitchen, I was able to ask for a monthly rate and they had two pools! 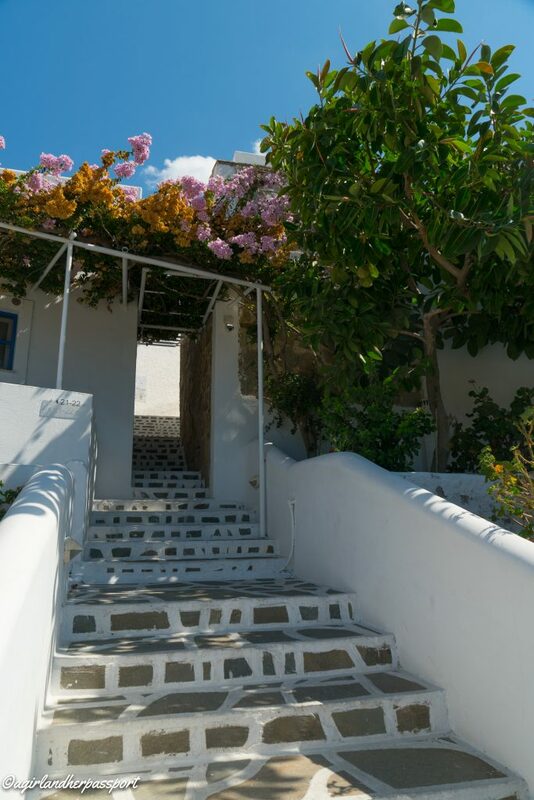 The hotel is set up like a small Greek Village and has all the lovely characteristics of that including whitewashed walls and blue doors. There are less than 50 rooms and it feels like even less. The reception area is located outside the village right on the road from the port. You can walk from the ferry to Kritikakis Village Hotel. The two pools are located on two different levels. One has the pool bar and the other has built-in sunbeds and is smaller. The smaller pool is also more shallow. The pool offers great views of Yialos beach. Breakfast is served a few levels up with a small cold breakfast and offers traditional Greek yogurt and delicious local honey. 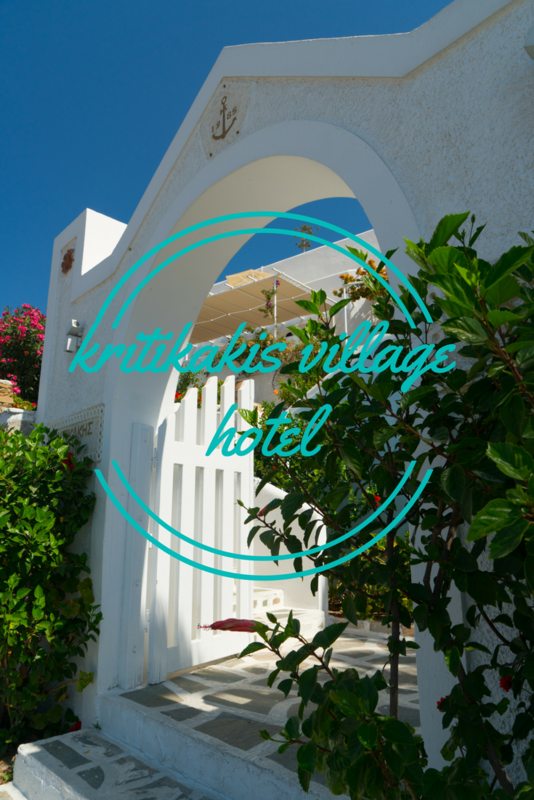 There are many room options to choose from at Kritikakis Village Hotel. 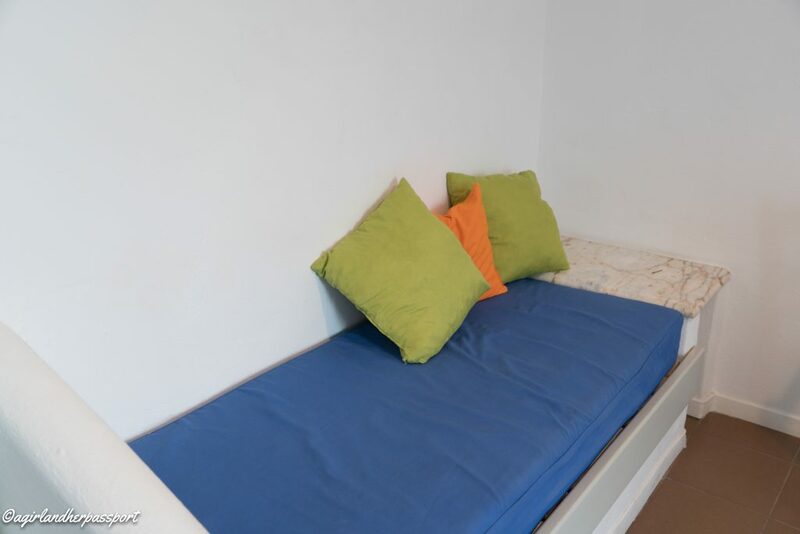 You can choose from a studio with many single beds or a double. You can also choose an apartment style room that has a separate living area. 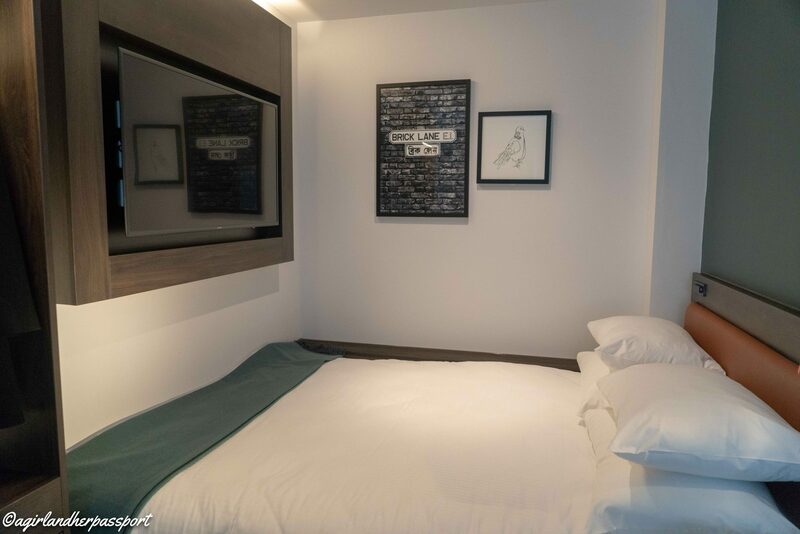 The great thing about these rooms is that it allows for groups of friends to split the cost of a room and each have their own bed. 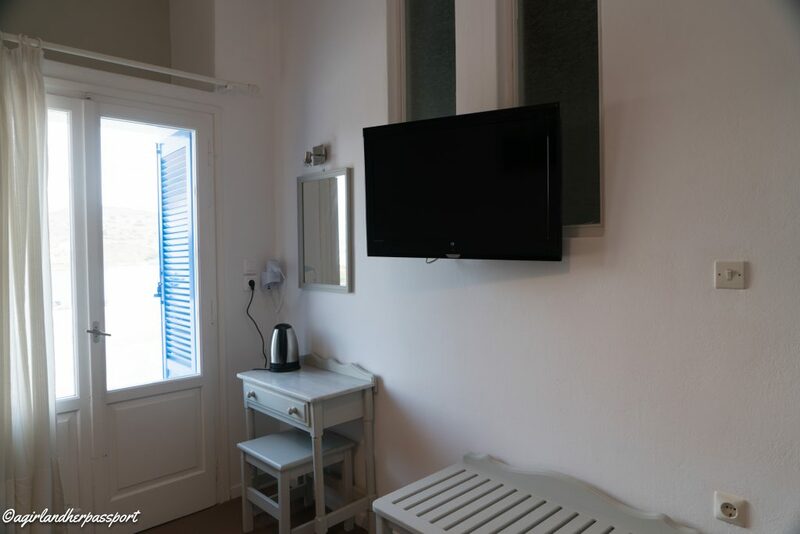 The apartments are great for couples or people with small children. I chose an apartment since I really didn’t want to look at the kitchen for a month! When I contacted them about a monthly rate, they offered me a double bed apartment at a discounted rate. This was something you definitely had to contact them about and it may not be available during the high season. It was more than I wanted to spend, but I was very happy that I chose to do this instead of the studio. The benefits of staying in a hotel for a month was that I had daily maid service if I wanted. This meant no washing sheets and towels or mopping floors, which is definitely a plus while on vacation. It also meant I had help planning things or calling restaurants for reservations. My apartment had a large terrace with a table and chairs and umbrella. Many mornings were spent here having my breakfast. The hotel also faces the west so you can catch a view of the amazing sunset on Ios. You are also close to the port and I could hear the ferries come and go, which I enjoyed. I preferred this location versus the village or the party beach of Myloplotas. 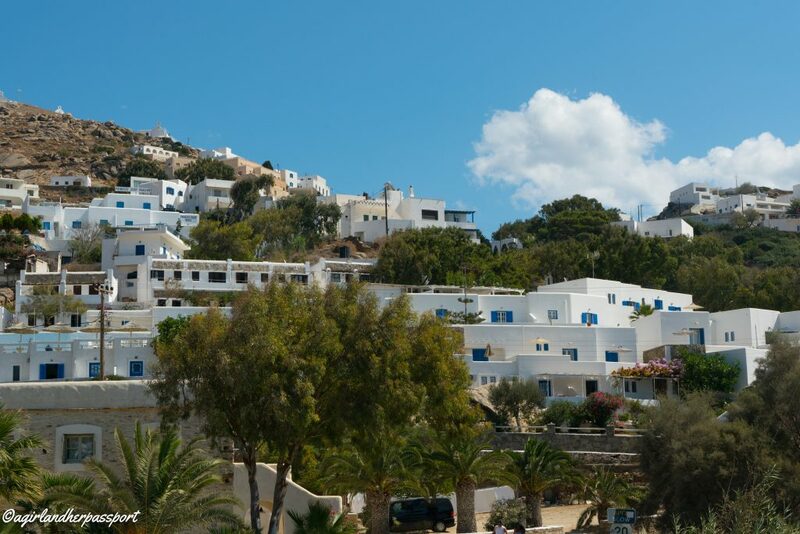 I was close to the port, a grocery store, Yialos beach and many great restaurants. The bus stops right outside of reception and it takes you to the village or Mylopotas beach. You can also walk the path to the village if your legs are up for it. The path is also right next to Kritikakis Village Hotel. By far the best thing about this hotel was the friendly hotel staff! They made my stay very memorable. Many times I would come back to my room to discover fruit or chocolates. 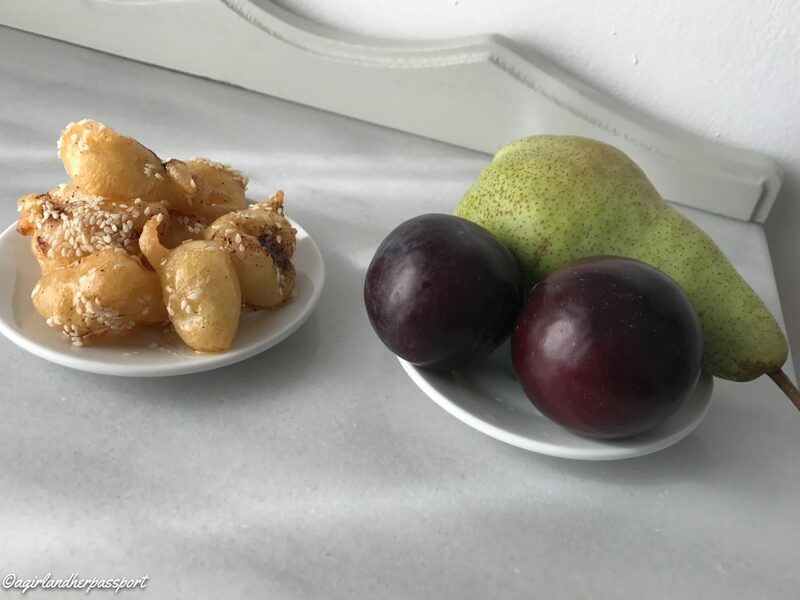 One day I had a knock on the door only to be presented with a plate of fruit and loukoumades, Greek donuts! I chatted with the staff almost every day and made good friends with them. One night they even asked me to have dinner with them. It definitely made my time in Ios less lonely and I would have missed out on some great restaurants without their help. When I checked out they gave me a Kritikakis Village Hotel t-shirt! Which I have worn in Portugal a few times. 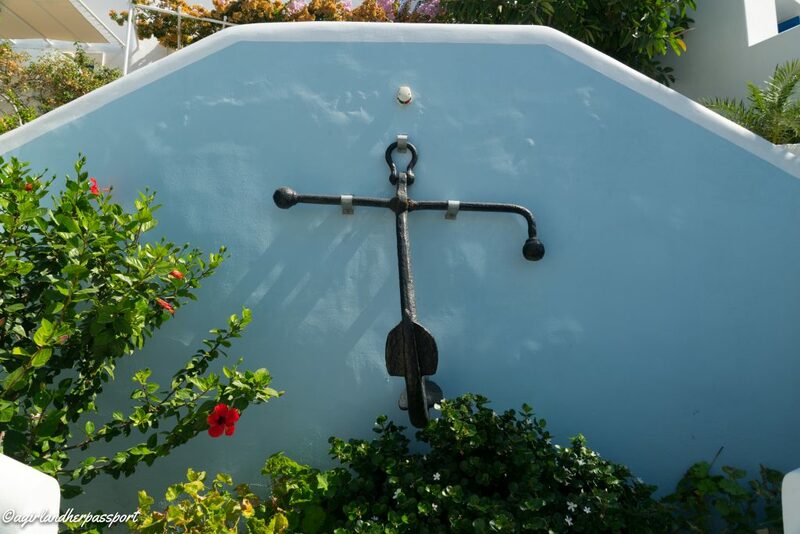 As I mentioned before, Kritikakis Village Hotel is located not far from the port in Ios, Greece. There is also the bus stop right outside the reception door. The bus takes you directly to the Chora(village) and then onto one of the best beaches. In the port area is many restaurants, a grocery store and a bakery. 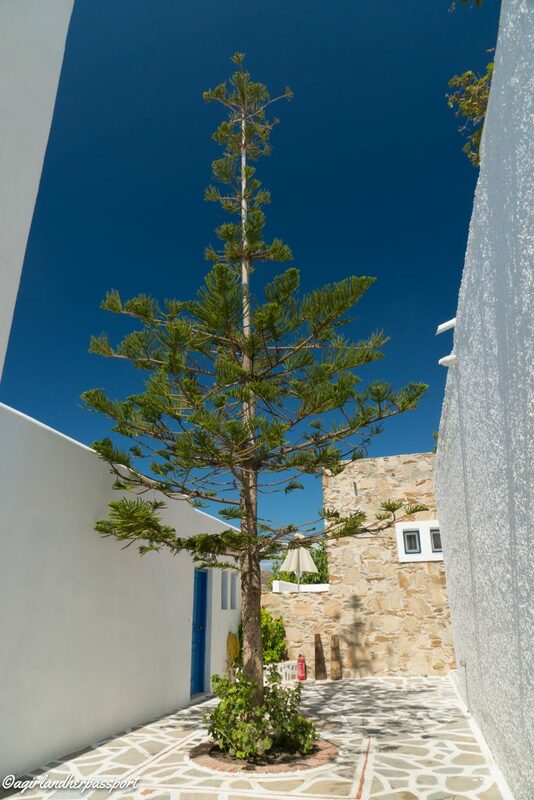 Kritikakis is located in the best spot in Ios, Greece! 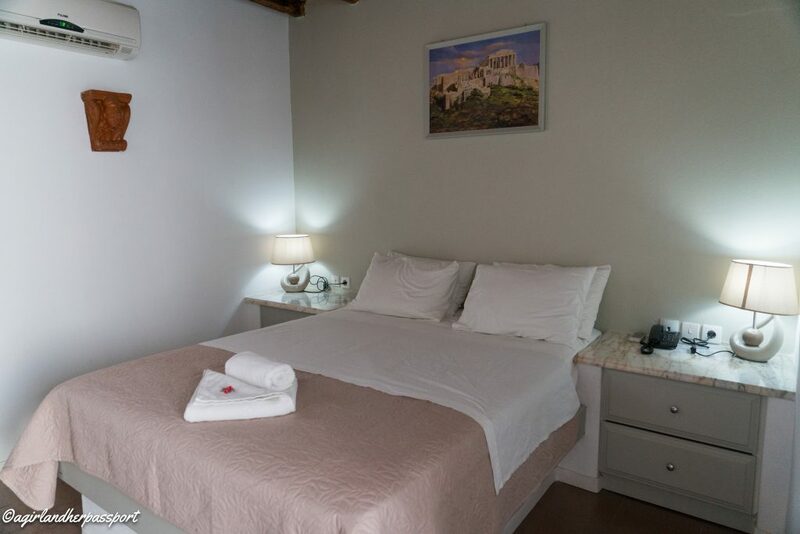 So if you are planning a trip to Ios, Greece, I highly recommend staying at the Kritikakis Village Hotel, check rates here. 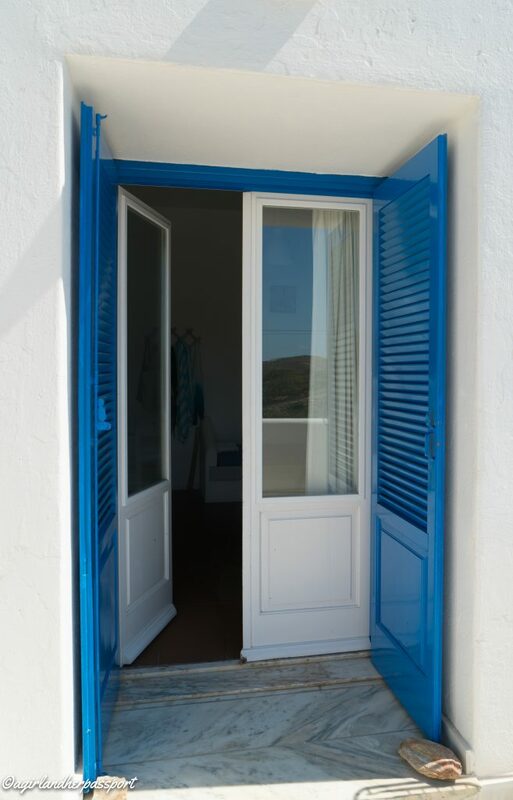 You will feel at home right away and be close to all that Ios, Greece has to offer! 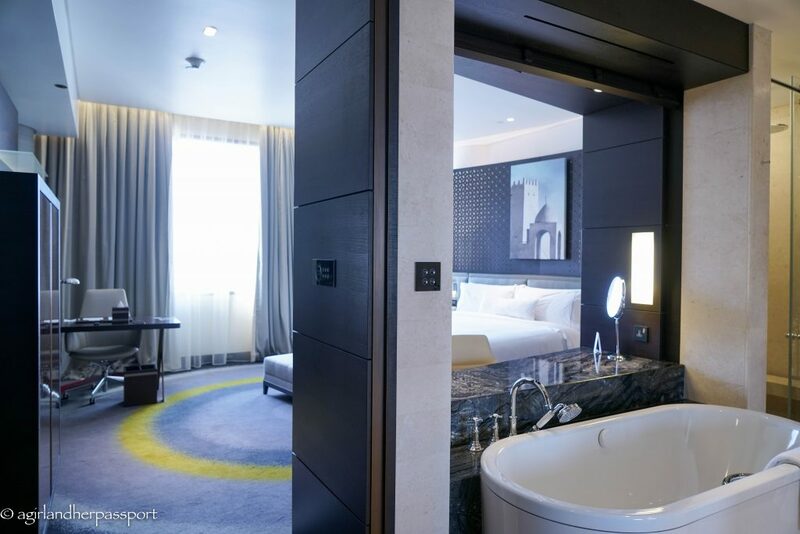 Back in December, I won a free night stay at the Westin Doha. The Westin Doha is a newish hotel in Doha and it is not in the area where most of the hotels have been built. In the past few weeks, I have read a few negative reviews regarding events and a few of the restaurants. Since the voucher was going to expire and I am about to leave, I thought I would give it a try and have a staycation for one night. 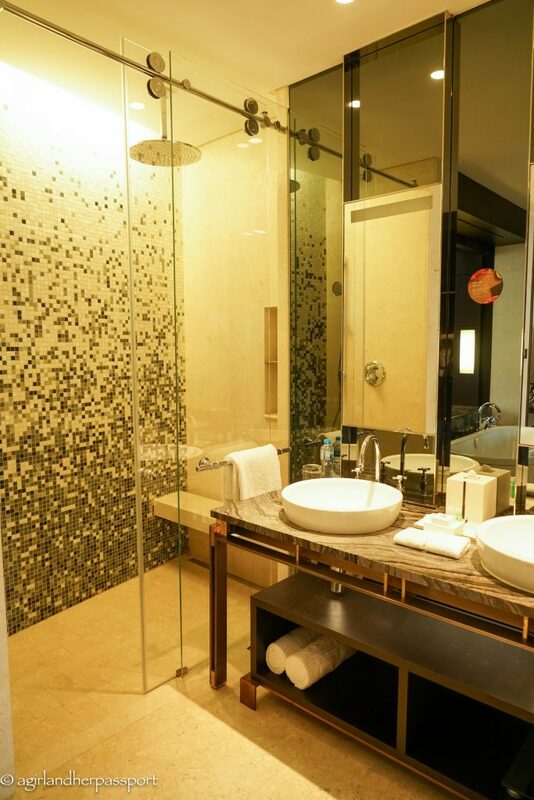 When you enter the room, you are greeted with a panoramic view of the whole room, including some of the bathroom. After I noticed the open layout of the room, the next thing I noticed was the soaker tub that looks out over the room. I couldn’t wait to get it and soak for a while. It seemed like you could see the television from the tub. Watching a movie from the tub sounded like a great idea. Unfortunately, I couldn’t see the tv from the tub. This was due to the divide between the room and the bathroom. Seems like a huge design flaw. However, the rest of the room was pretty great. My room was a deluxe room with a pool view. The room was quite large and had a king sized bed. The Westin Hotel is known for its beds and it did not disappoint! Thick carpet with a beautiful design extends throughout. Heavy blackout curtains block out the Middle Eastern sun perfectly. 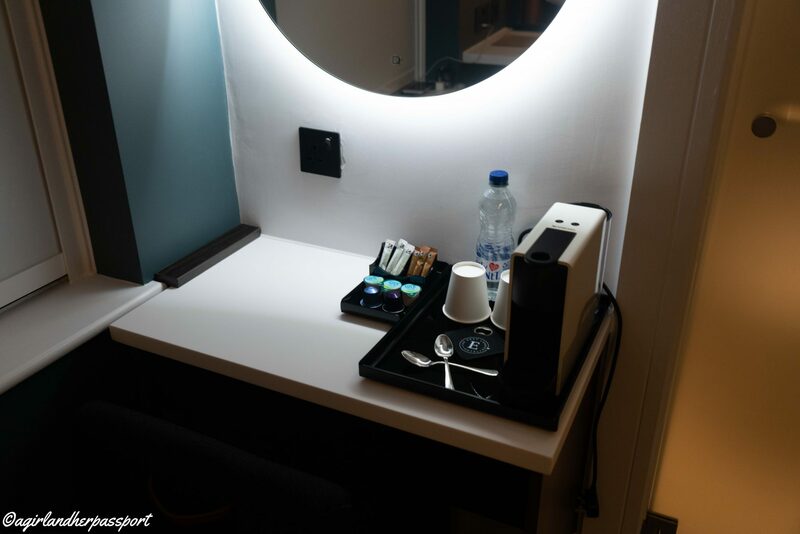 The usual amenities are present, such as a desk and a beautiful cabinet with the mini fridge and coffee and tea. For all the Brits out there, yes, there is evaporated milk for your tea! What was great was there were plenty of international plugs for all your devices. One complaint was that my room was right by the elevator and everyone is loud getting off the elevator. Not really the hotel’s fault, but the door could have been sound proofed. The other issue was that they had lights on sensors so when you get out of bed at night, you can see. Great idea, but they took forever to go off and one time it went off when I was moving around in the bed. The restaurant I had heard good things about was Sabai Thai. It is a small restaurant set back from the hotel. Unfortunately, you have to go outside to reach Sabai Thai, which during the summer in Qatar it could be an issue. When entering there was a Thai woman playing a traditional Thai instrument that had a lovely sound and was so much better than the loud music some place blast in restaurants. I did not order a starter as I wanted dessert. For the main course, I ordered, Gai Phad Med Mamuang. 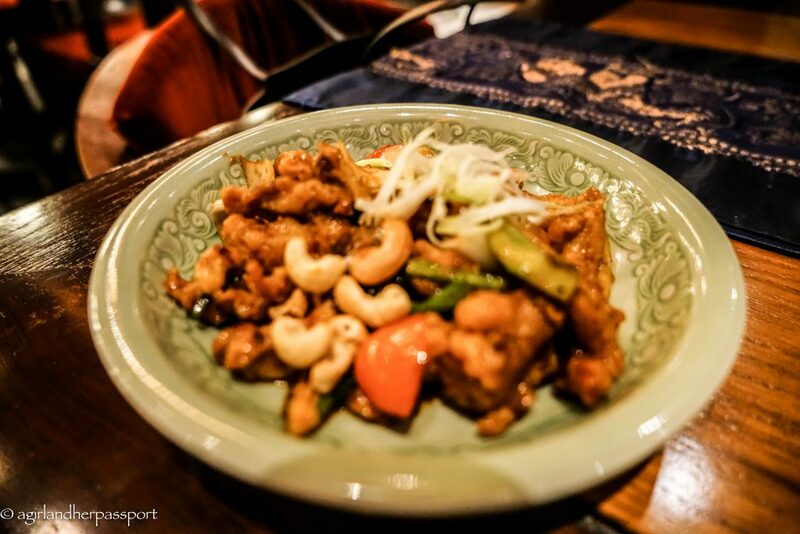 This is a stir fried chicken dish with cashew nuts, spring onions and chili paste. It was served with steamed rice. The dish was light and flavorful and they asked how spicy I wanted it. I said light since I wasn’t sure how spicy light would be. I could have gone with the medium. 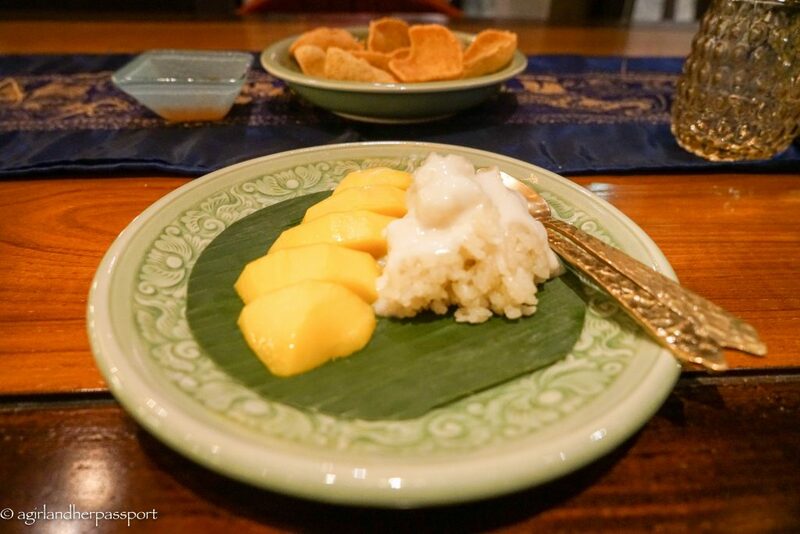 For dessert, I ordered my favorite Thai dessert of Mango Sticky Rice. Theirs was probably the best I have ever had! The mango was really ripe and the coconut sauce was not too sweet. In addition to good food and atmosphere, the service was great and never had to wait for anything. When I called to make the reservation, I had to email them the voucher, which seemed odd, but I went with it. After I emailed it, everything went smoothly. They even asked if I want to book any spa treatments and asked for my SPG number for points. This service was the same when I arrived. Someone greeted me when I entered and escorted me to the check-in desk. While checking in, I was brought a hot towel and a juice. About 15 minutes after I arrived in my room, the front desk called to make sure I was happy with my room. While I didn’t call them for anything during my stay, I am sure it would have been quick and efficient. Upon checking out, I was also given great service. There was only one person checking people in and out. Another staff person saw me waiting and quickly went to a desk to check me out. Overall, I really enjoyed my stay and if I was in Doha longer, I would be going back for another staycation. The pools are huge and look amazing. I also wish I had more time to explore the menu of Sabai Thai. Have you stayed at a Westin? What was your experience? Driving down the dirt road, you have no idea there is a luxury hotel waiting for you at the end. You almost have to reach the end of the road before you can see any of it come into view. 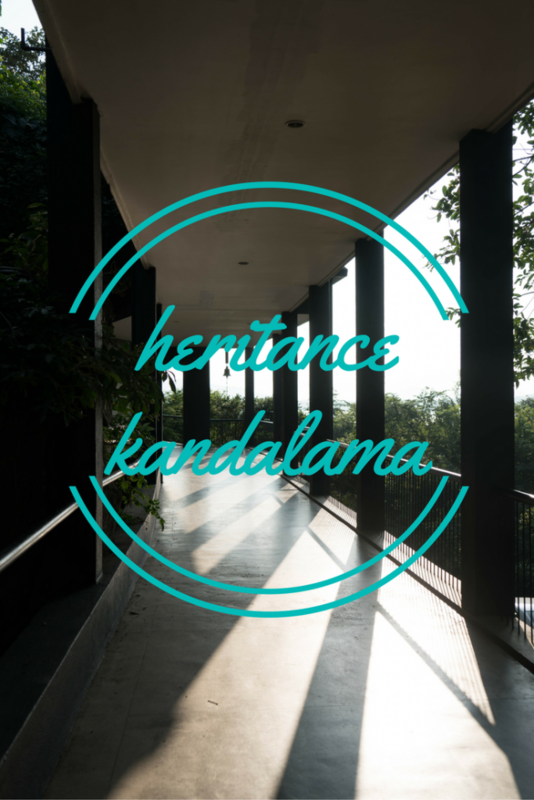 Then the top of the hotel peaks out and the road curves up a hill, and there is the Heritance Kandalama hotel. Well, what isn’t hidden in the jungle. Never I have seen a hotel like it before. It almost looks like the hotel time forgot with vines hanging down the front of the building. 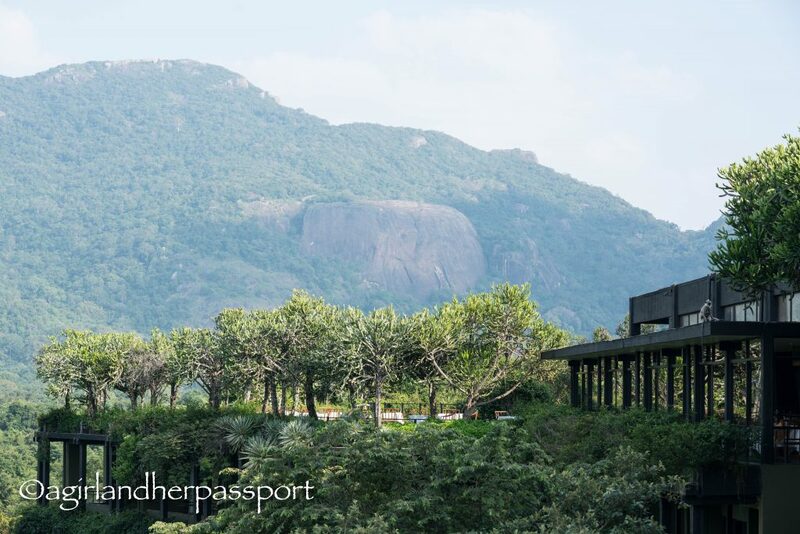 The hotel is built around the rock face facing the Kandalama Reservoir. 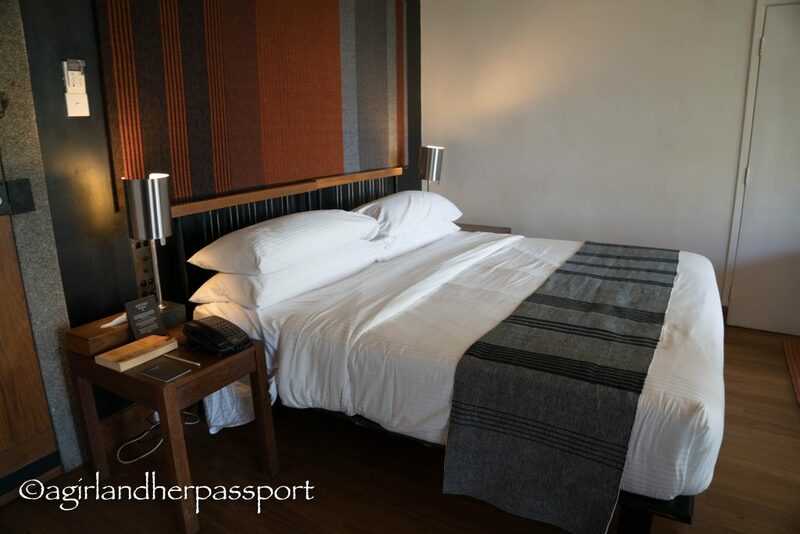 The hotel was built by Sri Lankan architect, Geoffrey Bawa. He designed it to blend in with nature allowing it to envelop the hotel and for waters and animals to be able to go under and around it. Hallways of the hotel are open to surrounding rock face and the room balconies face the jungle. There are even signs on the doors warning you to keep them shut so that monkeys do not get it. Nature truly surrounds the hotel. While there I saw monkeys, huge squirrels, hawks, cranes, starlings, other birds and a centipede! (None in my room, though.) Not all of it was wonderful, though. Keep reading to find out why. Every room has a balcony overlooking the reservoir at different heights. One wind faces Dambulla and the other Sigiriya. On a clear day, you can see Sigiriya Rock. 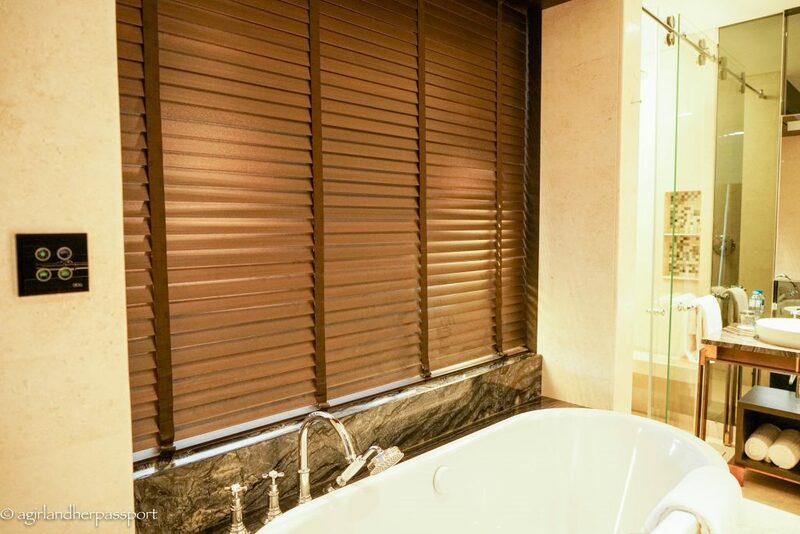 The rooms are decorated in dark tones that match the surrounding nature. My room was a deluxe room, which is the most basic room. It was on the smaller side, but since it was just me, I did not mind. The bed was very comfortable, and the air conditioning worked so well, I had to turn it off! 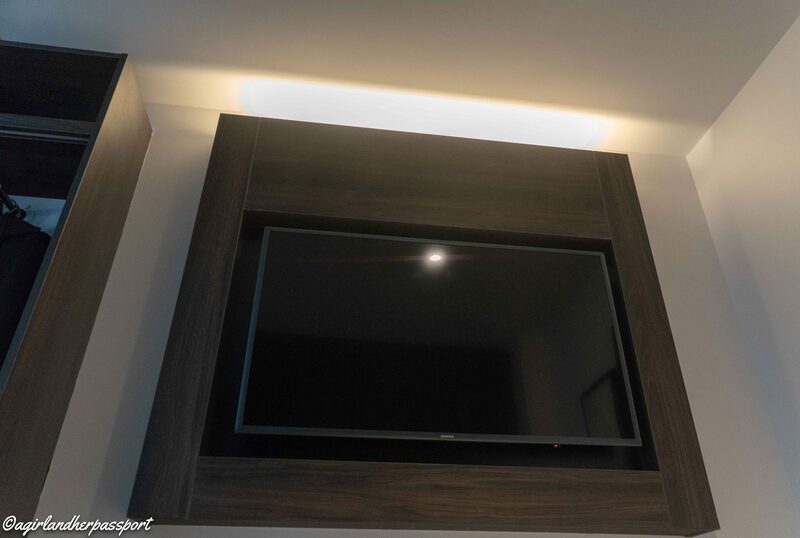 However, the dark tones that look so nice during the day make it difficult to see anything in the room at night since the overhead lighting is not adequate. 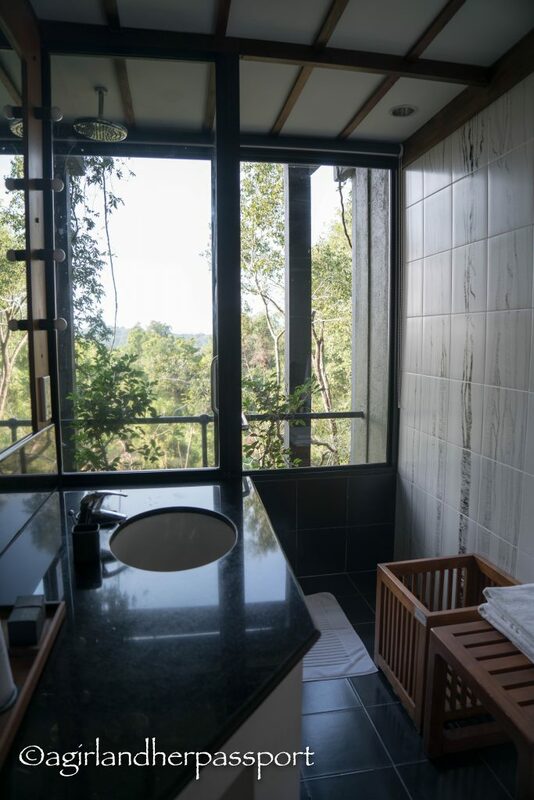 My bathroom also had large windows facing out to the reservoir, which gave it the feeling of showering outside. As I discovered early on in my trip to Sri Lanka, the water faucets work the opposite way of what I am used to, and it did take some time for the hot water to arrive. Due to the threat of monkeys and mosquitos, I did not spend to much time outside on the balcony. 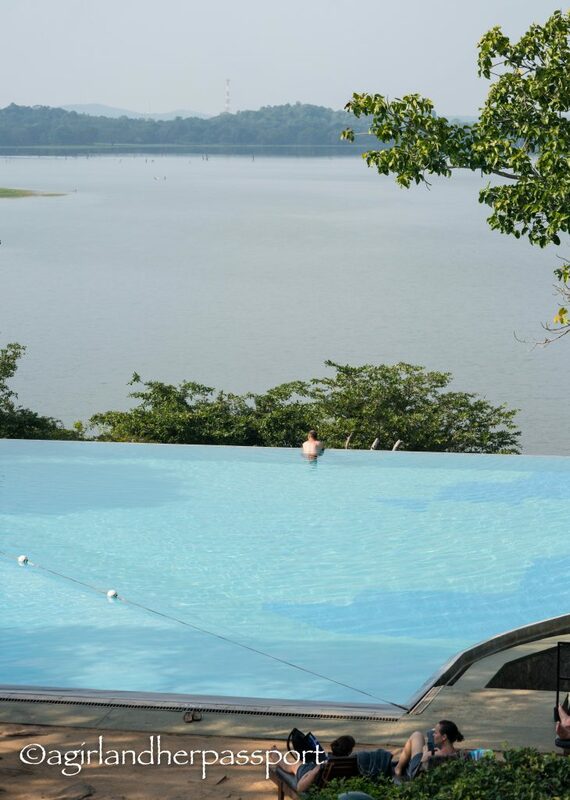 I spotted many monkeys hanging out on the hotel and around one of the pools! Overall, the rooms were nice, comfortable and clean. There are three pools! Each pool is on a different level and has different scenery. I elected not to swim since I was not sure the water was warm enough for my now thin blood! And I wasn’t going to swim at the one where I saw the monkeys. Located on the 6th floor was a wonderful lounge area with ample seating. You could spend several hours reading on these couches. If you are lacking reading material, there is a library on the top floor that you can take a book left by others. There is also a Six Senses Spa on site. I never ventured down that wing to see what it looked like though. I was too busy looking for elephants and monkeys! Not only that, but this hotel is supposedly a mile long from end-to-end. I wasn’t going to walk a mile to get to the spa. This was one of my complaints. The hotel is isolated and there isn’t any option but to eat at the hotel unless you want to take the 20-minute ride down the dirt road to the tiny town. There are only two options in the hotel as well. One is a buffet dinner and one a sit-down. I opted for the buffet both evenings because I was pretty tired each day. Both nights I was disappointed. The food the first night was terrible. The second night it improved, but given the amazing food of Sri Lanka, I was sad to find out that very few Sri Lankan options were offered. The breakfast was better, but the meat was being served outside with the bugs. My last morning, I decided to walk down to the reservoir’s edge. I had been told it was safe. I was looking to get some shots of wildlife at a different angle. Instead, I was greeted with a huge disappointment. Chained up by the reservoir was an elephant for riding! I was almost in tears. The elephant scared me as I didn’t know he was there and was chained. He or she looked mad! I couldn’t believe the LEED certified hotel had an elephant chained up. I have written a letter of complaint to the hotel. For this reason, I cannot recommend you stay at the hotel. A friend of mine told me after she found out I stayed there, that she stayed there last year and the elephant was there then! If the hotel writes me back with a positive response, I will update this post. 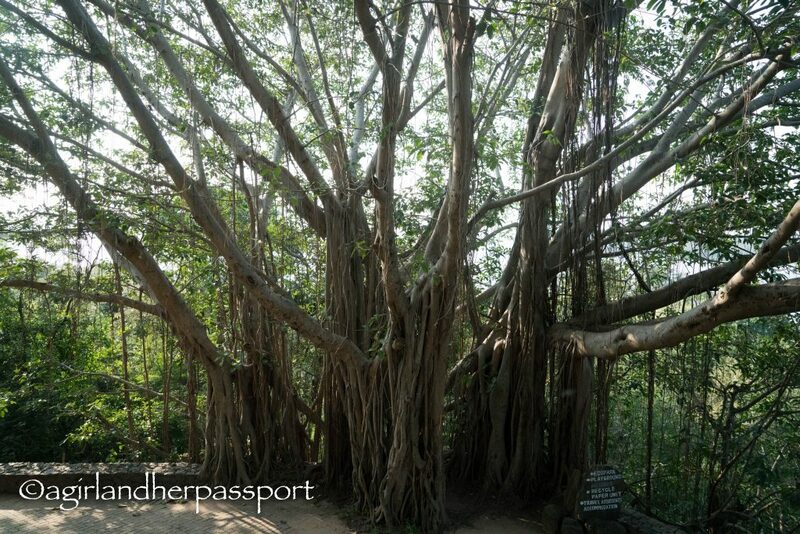 Since I can’t recommend it, here are some other options in Sri Lanka offered by Lauren of #ljojlo. If you do decide to stay here, you can check rates here. Update: The hotel responded to my email with some positive things. I won’t copy and paste the whole email as it is long. Basically, they know it is an issue. They have to change it from riding the elephant to walking with the elephant. The hotel does not own the elephant and leases her and chooses to do so they can keep an eye on her to make sure she is being cared for properly. They were happy to receive feedback to share with the person that owns her and help convince him to change his ways. As I say about anything, change takes time, and the hotel and I understand that. The asked me to write back with any ideas or suggestions regarding this. I will be asking for the elephant not to be chained and not kept in such a confined area. I am so happy they responded and have taken action!